Come see us for your everday automobile service! We are FasTrack Automotive, here to serve all your consumer and fleet vehicle repair and maintenance needs. Conveniently located just off Route 128 in Peabody, Mass, we offer dealership level service and atmosphere at a fraction of the cost. Whether you need an alignment, tires, a/c service, right through major engine and transmission repairs, we are your one-stop shop. We will offer you a complementary loaner car for extended repairs, or you can wait in our comfortable waiting room and enjoy a free hot or cold beverage, log on to wi-fi, or watch our big screen TV while you wait for your repairs to be completed. Our experienced, factory trained technicians will explain the needs of your vehicle and provide you with the best option to get you on your way quickly and safely. Scott Rosnick and Jamie Kekeisen, the Owners, will ensure that your service will be done in an honest, trustworthy and professional manner. Scott has been providing quality car care to the North Shore for over twenty five years. Located one half mile from the Centennial Drive exit off Route 128 (exit 28), we are ideally located to drop off your car on your way to work in the morning, take our complementary loaner car, and pick up your car on the way home, all at a significant savings over the dealership. We are convenient to Routes 95 and 1, as well as Peabody, Salem, Danvers, Beverly, Marblehead, Middleton, Lynnfield, Wakefield, Cape Ann and the North Shore of Boston. 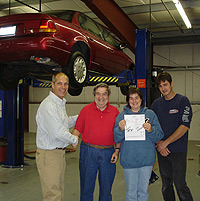 "I went to FasTrack Automotive in Peabody, MA. If anyone is looking for a good suspension shop in MA, or shop in general, I cannot recommend them enough. I left there with a smile on my face, confidence in the work, and I'm going to go back to them for future work, despite the fact that it's an hour away from me." © 2013 FasTrack Automotive, Inc. All Rights Reserved.